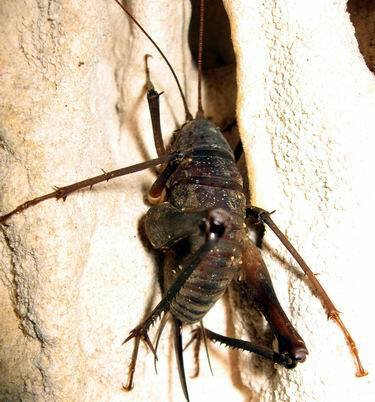 The giant cricket was discovered from the cave and epigean habitat in Waigeo island. The length of the body is about 4-4.5 cm and the antenna reached 8 times of the body length. This cricket was the biggest as known so far from Indonesian caves. The crickets is could be a member of Family Rhaphidophoridae, the genus is still need further study but it might be belong to genus Rhaphidophora sp. The number of individuals in the caves is so low. They are sit on the cave wall only 3-5 individuals. They are less sensitive and relatively easy to collect. Any scientist who are interested to examine the materials, please feel free to contact me. The depository of the specimens are in our museum (Museum Zoologicum Bogoriense, Cibinong INDONESIA). from → Did You Know?? ?